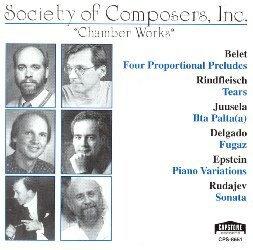 This CD presents chamber compositions of six contemporary composers working in the U.S.A. It is a compilation CD made up of thematically consistent recordings from independent projects. In this project, I am involved as a performer of the Sonata for Piano and Violin by Alexandre Rudajev (tracks 9.-12.). This CD is not available for sale.